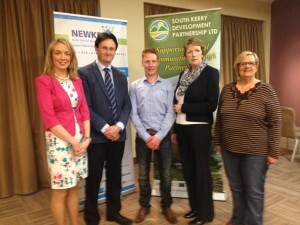 May 2016 – South Kerry Development Partnership CLG. There is strong interest in securing potential jobs in the hospitality sector if the turnout at a “Foot in the Door” event in Killarney last week is anything to go by. The event organised by South Kerry Skillnet was aimed at providing people with an interest in taking up employment in the sector with information as to the types of jobs and opportunities available. In addition, those attending were informed as to the possible training opportunities that are available to them in order to develop relevant skills. 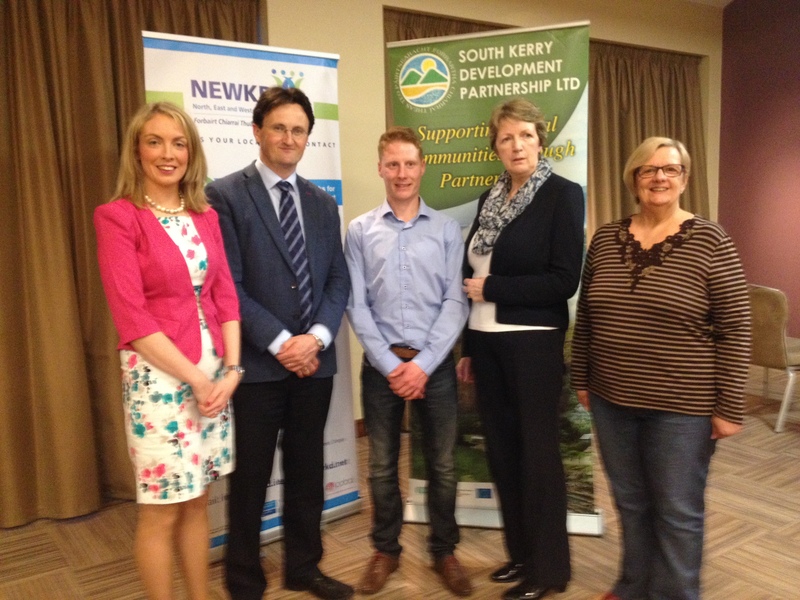 Speakers at the event held in the Killarney Plaza Hotel included representatives from the industry as well as the training sector and those present were also addressed by a recent Skillnet training programme graduate Sam Donnelly from Killarney. Attendees were also given demonstrations in some of the key basic skills required by employees in the hospitality sector. South Kerry Skillnet Manager Aoife O’Reilly said she was delighted with the turnout and the interest being shown by jobseekers in hospitality sector given there is strong demand within the sector for employees with the right skills. “All of the recent graduates on our Skillnet training course secured jobs and some of the employers who attended this Foot in the Door event had jobs available for people who had relevant skills” Aoife said. She added that she would like to thank all of the speakers at the event. One of those who have secured employment following the Skillnet Training course, Sam Donnelly said that he would recommend such a training course to anyone. “To be honest, I was not really interested when I started out on the course but as it went on I really started to enjoy it”. “It gave me the chance to learn a lot of new skills such as bar tendering and it also showed me that there are real chances to go on and get new skills to develop a career in the sector” Sam said. 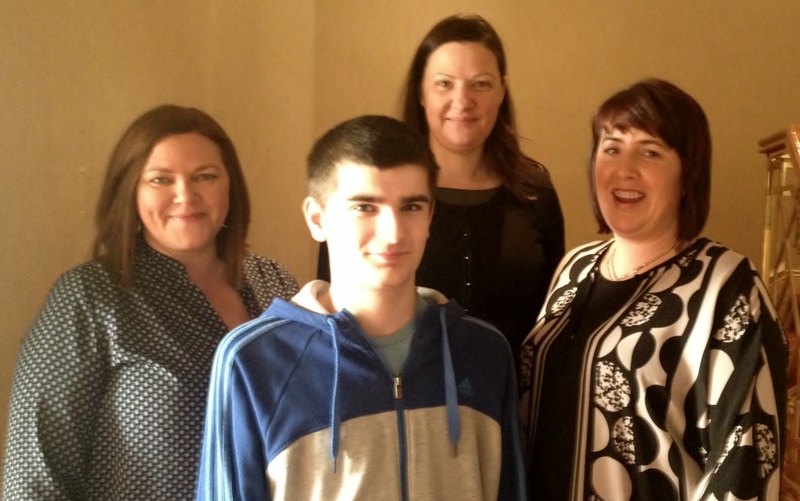 He added that he now hopes to get further education and training while continuing to work so that he can go on and further his career in the hotel sector in particular. Aoife O’Reilly added that they hoped to run further training courses either later this year or early next year given the strong demand for staff. 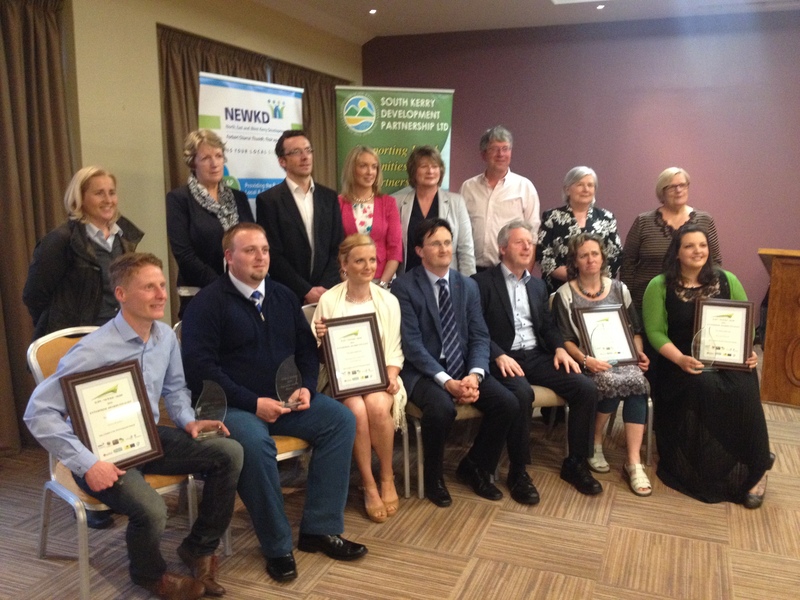 Four Kerry businesses were this week selected to represent Kerry at the Munster regional competition phase of the Irish Local Development Companies Network national enterprises awards competition. The businesses, two representing South Kerry Development Partnership Ltd. and two representing North, East & West Kerry Development, were chosen from an overall entry of circa 40 businesses from across the county in what is the first year of the competition. The South Kerry winners were James’ Barber Shop and K&T Bakery while the North Kerry winners were Maura’s Flowers and The Gluten Free Kitchen. All of the businesses who entered were set up since 2011 with assistance from the Local Development Companies through the Back to Work Enterprise Allowance scheme in conjunction with the Department of Social Protection. Welcoming everyone to the event, SKDP CEO Noel Spillane stressed the importance of the Back to Work Enterprise Allowance scheme in providing unemployed people with the opportunity to set up their own businesses. What clearly came across from the applications received for tonight’s awards was the importance of the BTWEA/SEA funding in providing what many applicants termed as a ‘safety net’ as they established their businesses ” he said. Noel added that these small businesses were the backbone of the economy of regions such as Kerry and it is vital that they are given all the support possible to help them succeed. Maurice Lawlor of the Department of Social Protection described the event as a celebration of the businesses involved pointing out that the entrepreneurs that set them up took big risks and should be recognised for their courage in taking the step from unemployment into starting their own businesses. “The overall Social Welfare Budget is circa €20bn a year and the Back to Work Enterprise Allowance programme is a very valued part of this spending” he said. Maurice also noted that large locally owned businesses already exist in Kerry which proves there is opportunity for these smaller enterprises to grow. “I would encourage people to recognise the potential of the businesses they have started and to think bigger & better” he said. NEWKD CEO Eamonn O’Reilly congratulated all the businesses who took part in the event and said that he was sure the award winners would represent Kerry very well in the next stages of the national competition. “It is great to see the families of the business owners here tonight also and the support of both family and friends is very important to these new businesses when they are getting up and running” Eamonn said. He also encouraged the businesses present to take the opportunity to network with each other saying that some of them were involved in complementary business areas and could potentially work together in the future. The national final of the competition is due to take place in Dublin in September. The BTWEA/SEA schemes are funded by the Dept. of Social Protection and the Local Development Companies are supported by the Social Inclusion & Community Activation Programme (SICAP) in rolling out the schemes. Are you over 30 and could do with taking some time out just for you?? Then the Time for You workshop may be just what you are looking for. Dealing with Stress, Emotional Well-being & Relaxation, Coping & Resilience and Personal Development & Mindfulness Mediation are the topics that will be covered over this 4 week workshop session. Interested in a Job in the Hospitality Sector?? South Kerry Skillnet is hosting a Foot in the Door Event for people who may be interested in securing a career in the Hospitality Sector. The event aims to provide participants with an understanding of the opportunities that are available in the industry as well details on how to acquire the relevant skills. Some employers will have jobs available at the event for people who already have relevant skills. The Kerry Education & Training Board as hosting an Education & Training Fair in the Brandon Hotel Tralee on Thursday 12th May. Guest Speakers at the event will include SKDP’s Education & Training coordinator Mairead O’Sullivan.